Courtesy of Alexander Brylin, Sakhalin, Russia. 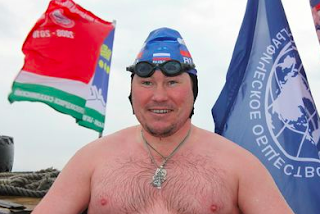 Alexander Brylin is organizing the International Swim across the La Pérouse Channel, an unprecedented 40 km international relay between Sakhalin, Russia and Hokkaido in northern Japan in July 2019. Brylin explains the preparations for the 20+ person relay across La Pérouse Strait, "We studied the currents from the Russian side. We already swam in the area in Russian waters earlier this year. The currents change and the water is rather cold. We swam 13 km in 3 hours 26 minutes, but then it became very foggy and the sea was rough. The weather changes very quickly there. We are recruiting swimmers now." Interested and qualified swimmers who can handle rough sub-10°C water can email Irina Makarova of the Interregional Cold Water Swimming Association in Russia headed by Brylin at irmak_05@mail.ru with a cc to Steven Munatones at headcoach@openwatersource.com as soon as possible.